The rising demand for optoelectronic devices to be operable in adverse environments necessitates the sensing of ultraviolet (UV) radiation. Here, a highly sensitive, fast responding Cu doped zinc oxide nanoparticles (Nps) based UV photodetector (PD) is reported. For the first time, Cu doped ZnO Nps are grown via forced hydrolysis of acetate salt of metals in a polyol medium. Various characterization methods including X-Ray diffraction, high resolution transmission electron microscopy and Fourier infrared spectroscopy are used to testify the presence of Cu element in ZnO Nps, although the diffuse reflectance and PL characterization are used to study the optical properties. The performance of the PD has been established by photocurrent measurements under different power density. Our device exhibited good photoresponse under UV illumination (375 nm) at 1 V bias voltage. Furthermore, the response of the PD is much better than other detectors based on oxide semiconductors nanostructures, and, especially, it shows a higher responsivity as compared with other photodetectors. In addition, achieved a highest responsivity of 40.12 A/W, quick response (rise/decay time of 0.8 s/3 s) and high sensitivity (2 × 104) for the Cu doped ZnO Nps annealed at 300 °C. It is established that the devices under higher power incident light show much lower 1/f noise. 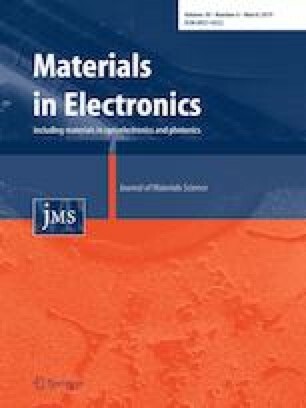 These results are meaningful to the noise control and performance improvement in the development of Schottky diode based PD-devices.